The authoritarian drift of the government, whether in deploying armed militia, packing the Supreme Court or taking TV channels off air, garners the greatest international opprobrium and the most irate domestic opposition. And it has treated chavista hate figures—General Raúl Baduel, Iván Simonovis and even, on a lesser scale, a Financial Times freelance—with exceptional viciousness. Excuses are available, yet futile: a bombastic government represents the majority of its people with neither gentleness nor grace. 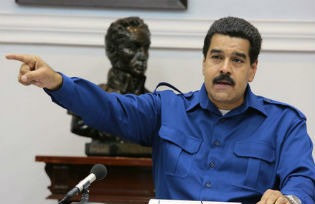 But successive election victories and consistent polling data underline that chavismo will not be defeated on the agenda of constitutional virtue. Economics and crime are what motivate mass popular discontent. Yet the past one and a half months tell a story not of a shared public platform, and an eventual if reluctant state response, but of a social dissolution into teeming individual claims, each in search of a protector. The obstacles, however, will be immense. Talk of clearly definable sides, of the sort which backed Maduro or Capriles last year and which each enjoy huge numerical legitimacy, is no longer so pertinent. The opposition is manifestly divided and its main propulsive energy comes from the leaders who have adopted the salida (exit) strategy—the plan to topple the president through street agitation. Leopoldo López is in jail; María Corina Machado has just been stripped of her parliamentary immunity. Seeking to lock both away appears to have redounded to the president’s benefit but this leaves the radical protest wing in place–just criminalised, localised and leaderless. Partial truths and worsening polarisation will do little to pull the country out of its confrontational logic. Nothing is more important than for foreign governments and organisations to provide moderates on both sides with support and reassurance. Just as Capriles has preached against violent protest, parts of Maduro’s government have proved themselves sensitive to criticism: the attorney general, Luisa Ortega, has said 60 investigations of police officers for alleged human-rights violations are under way. A common ground of dialogue could be found, were Latin American states, the European Union and neutral bodies to support it, on economic stabilisation and security reform. Talk of sanctions against government figures would have to be shelved and political prisoners released, with all parties accepting the schedule of forthcoming elections. Ivan Briscoe is a fellow of the Conflict Research Unit, which is part of the Clingendael Institute of International Relations in The Hague. After working as a journalist and newspaper editor in Argentina, France and Spain for over a decade, he now specialises in the study of fragile states, the effects of inequality and the emergence of organised crime.